As well as all the going-on-holiday, being-really-busy-at-work, getting-out-for-long-walks and seeing-wildlife over the last few weeks, there has of course been knitting. Yes, those are the fluffy brown bedsocks which I so disliked knitting…finally done. Now of course, thanks to the unusually warm April we’re in the middle of, it’s too hot to wear them anyway. Never mind, they’ll keep until autumn. 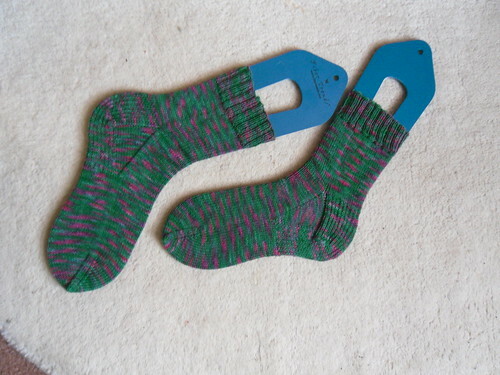 These are the SQL Socks, so named because I started them while away on a SQL cubes course. I enjoyed knitting them and they seemed to be finished really fast. The yarn is from Laughing Yaffle, one of my favourite local dyers. It is soft to knit with and lovely to wear. 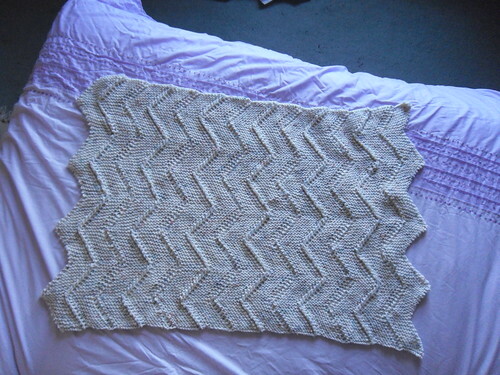 It’s a ten-stitch pattern, done in zigzags, by Frankie Brown. It’ll be perfect for tucking around visiting babies when they’re cold. Except…of course…that probably won’t be for a few months now! Anyway, new starts since all of these finishes include a pair of stripey knee-high socks and a bunny/tiny socks gift for my friend’s new baby (yes, another baby). I’ve also made some progress on the Forest Path stole I started ages ago. The jumper is languishing in a bag though, as I lost interest really soon after I started it. 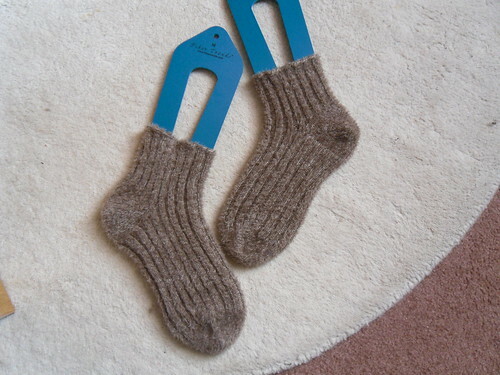 This entry was posted on April 23, 2011 at 8:24 am and is filed under knitting. You can follow any responses to this entry through the RSS 2.0 feed. You can leave a response, or trackback from your own site. Looooove the green socks! We’ve had a skip too, the problem is I think we could do with another one as it’s full already.